Once the stimulus was enacted, he turned his attention elsewhere. He appeared to believe that he had done quite enough to turn the economy around and thus moved on to other issues such as health reform, the environment and energy policy, which occupied an enormous amount of White House attention in 2009 and 2010.
channels. Perhaps the Federal Reserve could have been pressured to be more aggressive in terms of monetary policy. I have to confess that this line of criticism has always perplexed me. What does it mean to “single-mindedly” keep his attention on the economy? I just don’t understand how that translates into concrete action. I think Obama got briefed plenty to understand the trajectory of the economy (you really don’t need eight hours a day to figure that out) and I have a hard time thinking that it’s a good use of presidential time to insert himself into the details of the appropriation process. I also doubt that Obama really had much influence over Ben Bernanke. Maybe I’m missing something. Certainly you can argue that Obama’s pivot to the deficit in early 2010 was a mistake. But look at the jobs chart above. Yes, there were signs by early 2010 that the stimulus hadn’t been big enough, but as late as May job growth was continuing to tick up smartly, reaching over 400,000 that month — and plenty of liberals were crowing over this. True, some of that was temporary census hiring, but most of it wasn’t. The jobs picture really did look promising. Given numbers like that, what were the chances that Obama could have persuaded a nervous Congress to pass another big stimulus bill? 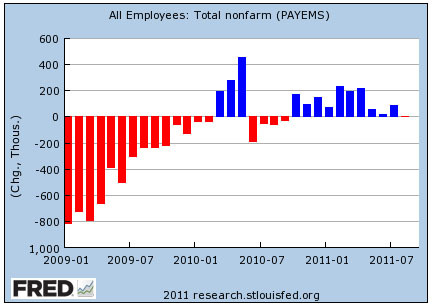 In retrospect, sure: of course Obama should have spent more time on the economy. But in the first half of 2010 that really wasn’t so obvious, and it’s light years from obvious that he could have done anything to prod Congress into significant action so soon after the 2009 stimulus anyway. Republicans were in full-out war mode, after all, and that’s not even counting the half dozen conservative Democratic senators who also would have been dead set against more spending. Maybe I’m off base here. But I really think we often overestimate just how much difference presidential “attention” makes. It’s just not possible to stay focused laser-like on the economy for years at a time when (a) things really do seem to be improving, and (b) your own party is eager to get moving on other stuff. That was the situation in early 2010. I’m not convinced that there was really all that much Obama could have done about it.